After finishing up the crocheted afghan I had a bit of yarn left over. 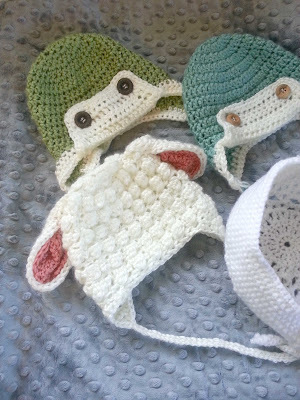 I thought it would be fun to make a few baby hats for newborn pictures, heaven knows that the little guy isn't going to NEED a hat mid-August, but he'll be so cute with one covering his big head (my boys all have them). These little aviators are adaptations of Repeat Crafter Me's Puppy Hat pattern. I just winged the little flap and added some buttons. I attached the ears a bit too high-woops. 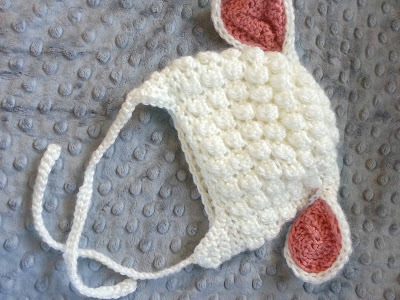 This little lamb hat is also from a Repeat Crafter Me pattern. I loved it when I saw it on her blog, so I made it. The creamy silk color of the yarn was perfect for the pattern. Gender neutral? I'm hoping so. I also whipped up a blessing day bonnet from the aesthetic nest. It really isn't photographed well, but you can see it sneaking in the corner. 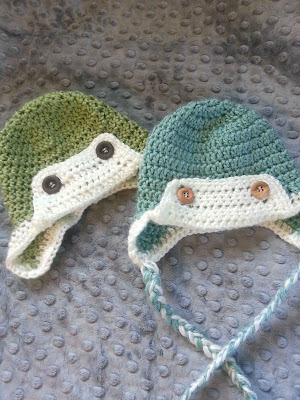 Not a bonnet for the boy, but for the little girls that go visit my photographer friend. I've found that I am really enjoying crochet. It is easier to pick up and put down than knitting, and is the perfect project to work on while letting kids play in the bath. It travels well in the car, and is a good stress reliever. Best of all, you can pretty much learn everything you need to know from youtube tutorials. You sure picked up crocheting fast! I love these hats. Wow all hates is so so nice and beautiful .